To make phone calls, send money, surf the net – that’s what brings people to this small call shop in Vienna. Homesickness and love, worries and hopes, doubts and uncertainty – all these issues are discussed in the small phone booths, where homeland and belonging stand in total contradiction. To keep in touch or to say farewell? – In her latest film, Nina Kusturica (Little Alien) tells of living in a foreign land and the yearning to overcome distances. From now on, Larisa has to get by on her own. Her husband has disappeared and left her alone with their joint debts and their business, a call shop. 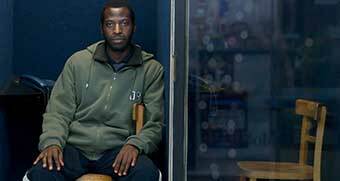 One day, Amari, who has lost his memory, stumbles into this international hub where people call their home countries and send money. 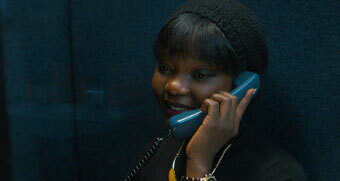 Amari tries to retrieve his memory by making phone calls to his sister in Nigeria. Ange is another regular here. Her longing for Romeo and for Leon, and for her home in Togo lead her to this phone booth. She is lonely. Leon’s warm voice coming through the phone receiver helps her forget her loneliness for a while. Reza, a young man from Afghanistan, has to contact his family back home on a regular basis. His parents want to marry him off and his wife-to-be is already excited. Seeking help, Reza calls his brother. In one hand he holds the receiver and in the other, the hand of his Viennese girlfriend Lisa. The only place Mimi feels safe is in the call shop. Here, she can talk over the phone with her lover in Rome. If only he would answer the phone more often! Dioma gets angry. Her boyfriend has returned to Senegal, because he’s had enough of Europe. Or has he had enough of her? They enter the phone booths, close the glass door and sit down at the phone, eager to hear their loved ones’ voices. They lie, dream, make confessions and love each other through the phone. The person at the other end of the phone becomes a space to project their feelings. What they try to conceal with words is betrayed by their voices. Dial tone. A young woman holds the receiver to her ear and waits. Busy tone. Only the second time around someone picks up, not the reaction she was expecting though. The conversation ends. ‘Two Forty’ is all she hears at the counter. In just a few close up shots, this concentrated scene immediately begins to navigate the microcosm of Ciao Chérie, Nina Kusturica’s third feature-length film. The director is also credited with writing and producing the film. The set is a Call Shop, one of those commercial hubs that despite the age of mobile communication are still scattered across the urban landscape offering services once the terrain of postal institutions. The tiny shop in Vienna’s ‘Ottakring’ district is reluctantly run by Larisa, after her husband disappeared to Belgrade and left her to take care of business. Meanwhile, it seems the whole world casually congregates in the shop – their diversity displayed in a medley of languages. There’s the shy Ange for example, who is in training and hopes, in vain, to lessen her homesickness for her native Togo on the phone. Mimi, on the other hand is having a secret and passionate affair with an Italian. She visits the shop to phone him or ask her best friend in Japan for advice. She shares her double life with an afghan teenager whose impending arranged marriage in his home country stands in stark contrast to his playful Viennese girlfriend joking around outside the booth. Ciao Chérie is, in essence, a chamber play. The few motives from outside the shop structure the film with views of the shop front and the immediate vicinity, the street view with bustling trams and the modern current of a culturally diverse Vienna. We are skillfully directed between the documentary style footage from outside and the fictional narrative from within the shop, the latter based on detailed research and embodied by a well-matched blend of professional and amateur actors. Rather than become limiting, the spacial confines serve as the glue binding the stories together as does the camera work of Michael Schindegger: from inside the shop with the delicate, kinetic reflections of glass surfaces – the fronts of the booths, doors, display cabinets, – he creates carefully constructed, multi-layered images which allude to the off-screen narrative. This represents nicely the somewhat ambivalent experience of talking on the telephone. It makes the speakers, physically separated by great distances, at least acoustically closer to another. It brings them temporarily closer together – though at the same time conscious of the physical distances present between them. The third element, decorating the many voices and stories, is the music. On the one hand the Wladigeroff brothers lend their arrangements to the films imagery and narrative, for example the melancholic layer of flugelhorn in the opening sequences. On the other, the characters sing a tune throughout the film like a trail of breadcrumbs leading back to home. Visibly detached from their person, the voices fill the empty shop with longing, fantasy and memories that cannot be captured through the phone. The shy Ange, sings: ‚I’ve loved you so long, I’ll never forget you’ Ange drops her shyness and starts to flirt. A person amounts to far more than the situation they are in at a given moment, a certain legal definition, or a classification a system assigns them. I’m interested in the other side of people: their internal, real existence despite external classifications and social restraints. Before I decide to develop and realise a film project, I gather elements from various areas – from the narrative, from filmic curiosity about a certain form and from social developments. I collect what seems important to me and then I find a terrain in which I’d like to move around in to tell the story. When thinking about a new project, I keep collecting until I discover ways to connect all the material I have gathered on all levels, as if they existed purely to be brought together. My work on my first feature Auswege (about three women affected by domestic abuse) and on my second film Little Alien (a documentary about unaccompanied minor refugees at the borders to the EU and in Austria) and the reactions they provoked, inspired me to consider cinema within a broader social context: Who is making films for whom? Who is even allowed to make films? What stories do these films tell? Which environments do they represent? And finally, who and what is seen and heard on screen? Where, if not in the field of art, should there be a privilege-free space regarding both production conditions and the conveying of content: the representation of the characters and their relevant stories, biographies and forms of expression? Out of this questioning, a desire arose in me to make a film that, like my previous films, interacts with and reflects social processes, but also captures the life situation of the characters in the aftermath of a big drama on the content level. In our noisy, voyeuristic world, where our concern for a person’s fate depends on the harshness of the trauma they’ve experienced, I wanted to tell of an inner moment – of the echo afterwards – which can be just as serious for a person as a threat coming at them from the outside. Time to say farewell, or…? For me, Ciao Chérie is an extension of my previous film Little Alien, in terms of a continued imagining of the characters, these people who come from somewhere else. Little Alien was about beginning a new life in a new country. Now I am interested in the time afterwards, in the issues people struggle with after their arrival. Because there are so many times in life where we arrive somewhere far away from our (old) home. This opened up a huge, partly uncharted and sometimes also taboo territory for me: the realm of the past and of people and places that have been left behind. Can I be in two different places at the same time? Can I be in the country I live in now, in the city where I sit in the Ciao Chérie phone booth, but at the same time, also be in the home of my loved ones at the other end of the phone? Which moments of their biographies define these people in their own eyes, and which define them in the eyes of others, of the society, and for how long? These people continue with their lives in a new place, with the whole range of their life issues. But when and how do they say farewell to their old homeland and those they’ve left behind? The phone calls made it possible for me to pursue these questions in a focused way. These were the first words Alexander Graham Bell said more than 140 years ago, when he made the very first phone call. With his experiment, he laid the foundation for the invention of the telephone rather by accident. What he actually meant to do was record acoustic sound waves to make what hearing people said visible to the hearing impaired. He didn’t succeed in his original plan, but he invented something else – the telephone. When I started developing Ciao Chérie, I was primarily interested in the old oral tradition of storytelling. I wanted to learn more about that instant the voice of the storyteller breaks the silence: where reality vanishes, and the audience enters an inner space. I searched for the origins of storytelling. The transcriptions I found of texts once only told orally, no longer contained any of the magic of storytelling. Only the voice of the storyteller can deliver the words in a way that moves people. This fact gave rise to a lot of questions. Film, as a medium, captures something. Capturing things, a certain moment maybe, be it fictional or documentary, is the very nature of film. So, how can I, as a filmmaker, capture a moment, without making it as hollow as a transcription? How can life unfold in film while using technical instruments like the camera and the projector? The issue of communication became the focus of my interest, in all respects – storytelling as a mediator between the story and the audience, film as a continuous flow between the chosen form and the story, between the filmic space of the screen and the cinema auditorium. The voice is a fascinating phenomenon. It is said that no two people in the world speak exactly the same way. I had entertained the idea of exploring the voice and also this concept of mediation for some time and written a few drafts for an essay film before call shops finally caught my attention. These rather inconspicuous, tiny shops are crawling with a whole universe of major social issues in their one-room settings. I just couldn’t stop thinking about them. And so my research began. First up on the agenda was visiting about 100 call shops in Vienna, as well as photo sessions, interviews, notes and auditions. While making Ciao Chérie, the working method and the content were developed side by side. One couldn’t mature without the other. Just like with the main topic of the film – the limits of the potential for interpersonal communication – for the form of the film, I also set out to understand how my chosen working method influenced the resulting scenes and vice versa – how the methods of the process changed as a result. Just like the topic of the film, this process of communication already existed behind the scenes. Nahoko Fort-Nishigami was born in Japan. She studied singing in Vienna and acting in Paris. As a soloist she has performed in the top concert halls of Europe and Japan. She appeared regularly in Vienna’s Volkstheater and played Jedermann’s seductress ‚die Buhlschaft’ in Garmisch-Partenkirchen, Bavaria. Nahoko Fort-Nishigami has also appeared in numerous film and television productions including leading roles in Tatort, Trautmann, Der Chinese, Winwin, Oktoberfest, Der Rote Punkt and others. Sikavi Agbogbe was born in Togo and lives in Vienna. The role of Ange is her first role in a feature film. Alongside acting she studies Communication & Media Sciences, English and German at the University of Vienna. Simonida Selimović was born in Serbia and has lived in Vienna since her childhood. She began acting early in her youth in the children’s series Operation Dunarea, later in Nina Kusturica’s feature film Ciao Chérie. She has performed at the Schauspielhaus Essen as well as the Maxim Gorki Theatre, Berlin in the Roma Armee production by Yael Ronen. She has often worked with director Tina Leisch and appeared alongside her sister Sandra Selimović. The two sisters are involved in the Roma theatre group Romano Svato as feminist activists and rappers campaigning against racism and for equality. Simonida Selimović speaks German, Romani, Serbian and English. Ayo Aloba is an actor and musician with Nigerian roots who lives in Vienna. Aged 19 he moved to Great Britain and studied Performing Arts at the Rose Bruford College. After his degree he appeared amongst others in The Extraordinary Equiano (BBC Televison), Happy Family (London Film Academy) or Pentecost (St Leonard’s, Shoreditch/London), as well as numerous other film, music and theatre productions across the UK. Ayo Aloba also runs theatre and percussion workshops in schools and other institutes. Dioma Mar Dramè grew up in Senegal and Spain. Today she lives in Vienna. Ciao Chérie is her first time in front of the camera. Dioma was discovered by our casting agent Nora Friedel in Vienna whilst talking in a Call Shop in multiple languages simultaneously (Spanish, German, Senegalese). Esmat Azimi came to Vienna from Afghanistan during his youth. A friend of a friend invited him to take part in a casting session for Ciao Chérie and that’s how ‚Ali’ became his first role! Isabella Campestrini was born in Vienna. Since her childhood she has been in significant roles in various cinema, television, theatre and radio play productions such as: Auswege (Feature film, Nina Kusturica), Küss mich Prinzessin (Feature film, Michael Grimm), Geschichten aus dem Wiener Wald (Theater in der Josefstadt), You drive me crazy Hamlet (Dschungel Wien), Das Matratzenlager (Radio play, Paulus Hochgatterer). Isabella Campestrini is bilingual – native German and second language Croatian/Bosnian/Serbian. She is studying acting at the Anton Bruckner University in Linz and loves playing the piano. Mahamad Abdiasis is from Mogadishu, Somalia and lives in Vienna. He is a known Somali singer by the name of Alfanan Arwaax Yare. Whilst shooting Ciao Chérie the film crew met Mahamad and his brother on the street. As a result he landed a role in the film. is an elegant Neo-Burlesque and “Cartoonlesque” performer. Her artistic performance style includes classical burlesque movements and dance combined with theatrical and comical performances. Each act is based on a story that ends with intrinsic messages or an unexpected happy end! Her pseudonym Vienna Chaconne is an hommage to the city she loves and expresses her elegant baroque approach to the stage: as was the Chaconne –the musical variation and dance popular in the baroque era. Radosav Jovanović was born in Serbia and grew up in Vienna where he lives and works. To date he has played in various documentaries and radio shows. The role of Boban is his first in a feature film. Radosav Jovanović also assisted the team of Ciao Chérie with translations from Romani, casting, and music research utilizing his great knowledge and experience. Zoran Šargić lives and works in Serbia and Vienna. Ciao Chérie is his film debut. He speaks Romani , Serbian and German. Nina Kusturica was born in Mostar and grew up in Sarajevo. She studied directing and film editing at the Film Academy Vienna, University of Music and Performing Arts. Her films including Little Alien (2009), Auswege (2003) and Draga Ljiljana (2000) premiered at festivals and won awards worldwide, including at: Mar del Plata Film Festival, International Film Festival Rotterdam, Berlinale Forum of New Cinema, Max Ophüls Prize Film Festival, Duisburg Film Festival, Premiers Plans Festival d’Angers, Mostra Internacional de Cinema Sao Paulo, Leeds Film Festival and many more. Nina Kusturica’s retrospectives and films have been shown in various artistic contexts and distributed internationally. With her own production company, NK Projects, she has produced numerous films, including her most recent feature film, Ciao Chérie. In addition to filmmaking, she directs projects for the stage and holds seminars, workshops and lectures in Austria and internationally at various universities and institutes for film, directing and acting. Michael Schindegger lives and works in Vienna. After training in photography at the Higher Graphical Federal Education and Research Institute in Vienna, he went to Bukarest for a year before studying Cinematography in the class of Christian Berger at the Film Academy Vienna. Included in Michael Schindelegger’s work as Director of Photography: L’Animale (2018, Director: Katharina Mückstein), Holz Erde Fleisch (2016, Director: Sigmund Steiner), Talea (2013, Director: Katharina Mückstein), Rimini (2007, Director: Peter Jaitz). His debut as a director came in 2008 with the documentary Dacia Express winning ‘Der Goldene Buchstabe’ prize at the Duisburg Film Festival and Best Documentary at film:riss. He directed his second documentary Nr. 7 which was released in cinemas in 2013. Michael Schindegger is co-founder of the work group and film production company La Banda Film. compositions from the current album „The Rag Waltz Time“ in co-operation with Božidar Radenković. Now based in Vienna, the twin brothers Alexander und Konstantin Wladigeroff, coming from a famous Bulgarian music family, attended the Conservatorium in Sofia. Alexander and Konstantin Wladigeroff have received international acclaim from the jazz music world for their virtuosic mix of classical and jazz. Andi Pils works in a variety of disciplines – sound engineer, sound designer, musician, dj, bassist and also actor. He co-founded the Primitive Studios in Vienna. His film projects include: Shops Around The Corner, Soldate Jeanette (awarded Best Sound Design at the Diagonale 2013) Private Revolutions, Die Geträumten, Das Leben ist keine Generalprobe, Das große Museum amongst others. Gerhard Daurer lives and works in Vienna. He studied Multimedia Art at the Technical College Salzburg and Sonic Arts at Middlesex University, London. During his studies he specialized in the interplay between picture and sound in audiovisual performance. He then joined the scientific staff at the Department of Science and Technology, University of Vienna from 2008-2009. He has since worked as a freelancer in media designer focusing on editing, sound design and music. Nora Friedel lives and works in Vienna as an artist and a film maker. After studying photography, she completed her degree in Transmedia Art at the University of Applied Arts Vienna. She has been working in film since 2007 in the areas of development, screenplay, casting, production and film agencies. 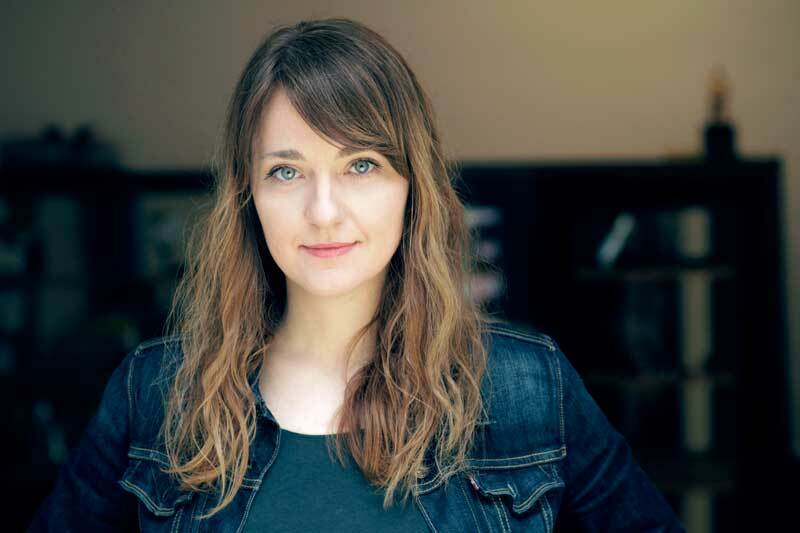 She directed her first narrative short film ‘Mimikri’ in 2016 – awarded with the Thomas Pluch Drehbuch Preis for short and middle length films in 2017. Marco Antoniazzi was born in Bolzano where he completed his studies at the ZeLIG School for Documentary, Television and New Media. He studied directing in the class of Peter Patzak at the Film Academy Vienna. Marco Antoniazzi works as a director and writer. His work includes: Schlagerstar (2013, with Gregor Stadlober; received the ‘Diagonale Audience Award’), Erinnerungen an die Stadt des Kindes (2011), Kleine Fische (received in 2009 the ‘Diagonale Audience Award’). Kusturica’s ‚Ciao Chérie’ is a lesson in humanistic thinking for all those stuck in the ‚us versus them’ paradigm. People come and go, seat themselves in one the glass booths, send money home to their families and tell their stories on the phone. Once the door is shut, the glass booth becomes something of a confessional box – a place of complete, stark honesty. Joyful faces, tears, awkward moments of silence or arguments are all captured. While they focus their attention on the other end of the line, yearning, the protagonists become isolated from their immediate environment. They seek solace in the confessional. For me though, as soon as the booth is vacated, the call paid for, and reality resumed – the isolation grows, further from the emotions and the ultra-reality left in the booth – the reality left in Japan, Syria, Nigeria, Italy and other countries. The yearning for their counterpart, the power of language and silence is what makes Kusturica’s stylistically so interesting. She is fascinated with the power of voices – voices that cannot lie over the telephone, that hide nothing – even when they try. The film, with it’s clever soundtrack, is a little like a trip around the world in a dream. The images show almost exclusively portrait shots of the callers – and yet they grab me and pull into the world they create. The telephone as an intimacy device and as an apparatus of alienation. Bonds, one wished to uphold, break apart. Fled, stranded, arrived, to stay or just wire some quick money. Words contain whole worlds as they generate a sometimes comical and eccentric microcosm – all part of the narrative universe of Ciao Chérie. The combination of conversation and picture (Camera: Michael Schindegger) opens doors to places only thoughts had resided. Spaces bigger than the lines spoken, bigger than the confession booth, than your own four walls of perception, the confines of loneliness and the edges of happiness. Where all is heard and only heard, every word becomes important, every breath, pause and intonation. Use is free of charge when a photograph is credited “Photo: NK Projects“ and it is used for reporting about the film. Please be aware that these photos are available exclusively for work associated with the film, duplication for other purposes is prohibited without the permission of the NK Projects. Trotz sorgfältiger inhaltlicher Kontrolle übernehmen wir keine Haftung für die Richtigkeit, Vollständigkeit und Aktualität unserer Webseiten, sowie für die Inhalte externer Links. Von den Inhalten der verlinkten Seiten – auf deren Gestaltung wir keinen Einfluss haben – distanzieren wir uns ausdrücklich. Diese Erklärung gilt für alle auf den Webseiten angebrachten Links und für alle Inhalte der Seiten, zu denen Links oder Banner führen. Der Inhalt dieser Website ist urheberrechtlich geschützt. Alle Rechte, auch der Übersetzung der Webseite, des Nachdrucks und der Vervielfältigung des Inhalts oder von Teilen daraus, sind vorbehalten. Der Inhalt dieser Seite darf in keiner Form ohne schriftliche Genehmigung der Nina Kusturica Projects reproduziert oder verarbeitet, vervielfältigt oder verbreitet werden. Obwohl die Inhalte unserer Seiten mit größtmöglicher Sorgfalt erstellt worden sind, übernimmt die Firma Nina Kusturica Projects keine Haftung für deren Aktualität, Vollständigkeit und Richtigkeit. Während Sie auf unsere Webseiten zugreifen, erfassen wir automatisch Daten von allgemeiner Natur. Diese Daten (Server-Logfiles) umfassen zum Beispiel die Art ihres Browsers, ihr Betriebssystem sowie weitere ähnliche allgemeine Daten. Diese Daten sind absolut Personen unabhängig und werden genutzt, um Ihnen die Webseiten korrekt darzustellen und werden bei jeder Nutzung des Internets abgerufen. Die absolut anonymen Daten werden statistisch ausgewertet um unseren Service für Sie zu verbessern. Zum Zweck des einfacheren Einkaufsvorganges und zur späteren Vertragsabwicklung im Rahmen von Cookies werden die IP-Daten des Users ebenso wie Name, Anschrift und E-Mail-Adresse des Einkäufers gespeichert. Eine Datenübermittlung an Dritte erfolgt nicht, mit Ausnahme der Übermittlung an Paypal zum Zwecke der Abbuchung des Einkaufspreises. Nach Beendigung des virtuellen Einkaufs bzw. nach Abbruch des Einkaufsvorganges werden die bei uns gespeicherten Daten gelöscht (oder: „bis zur Begleichung der Rechnung gespeichert“). Die Daten Name, und Anschrift werden bis zur Lieferung der Ware (oder: „bis zum Ablauf der Gewährleistungspflicht“) gespeichert. Die Datenverarbeitung erfolgt auf Basis der gesetzlichen Bestimmung des § 96 Abs. 3 TKG sowie des § 8 Abs. 3 Z 4 DSG. Die Daten, die Sie uns im Webshop mitteilen, werden nicht an Dritte weitergegeben. Da der Versand von uns direkt erfolgt, gibt es keine Veranlassung, Ihre persönlichen Daten weiterzuleiten. Ihre bei der Anmeldung gespeicherten Daten (E-Mail-Adresse, Name, IP-Adresse, Datum & Uhrzeit Ihrer Anmeldung) werden an einen Server der Firma The Rocket Science Group in den USA übertragen und dort unter Beachtung des “Safe Harbor Abkommens” gespeichert. Die Nina Kusturica Projects behält sich vor, diese Datenschutzerklärung zu ändern. Auch eine allfällig geänderte Erklärung wird selbstverständlich an dieser Stelle abrufbar sein.